Leverage your stakeholder relationships and get more out of your projects. 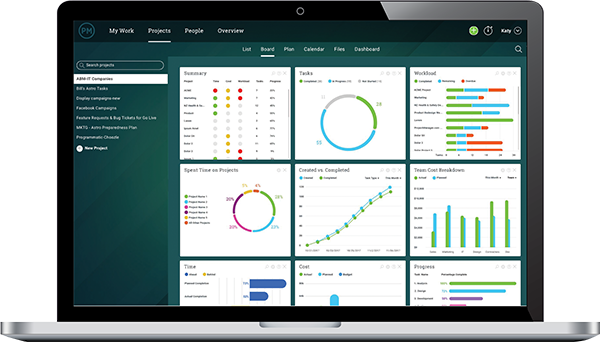 ProjectManager.com has easy-to-use tracking and reporting features that keep your stakeholders happy and informed. Experienced project managers understand the importance of stakeholder management. Stakeholders can influence many aspects of a project, including its budget, resources and overall progression — for better or worse. In order to manage stakeholders well, a fluid line of communication must be established. This requires that a project manager deliver regular reports to stakeholders and actively listen whenever stakeholders provide feedback. But before you can properly communicate with stakeholders, you must first identify them. The term stakeholder includes anyone that is affected by the project, both within your organization and without. Typical stakeholders can include investors, regulatory bodies, vendors, project teams, senior managers, board members and more. Obviously, not all of those stakeholders will be impacted by the project to the same degree, so the next step is to identify how and to what extent each stakeholder is affected. Now that your stakeholders have been identified, you need to analyze their interest in your project and their influence on its outcome. These two metrics combined will help you prioritize which stakeholders you should focus on as you manage your project. For example, if a stakeholder has a lot of influence over the project, but isn’t that interested in its daily progress, then you probably shouldn’t pester them with status reports every day. For help with prioritizing your project stakeholders, it’s common to perform a visual process called stakeholder mapping. Keep in mind that a stakeholder mapping matrix will only give part of the story, as stakeholders are human beings and will naturally react to events and communications in unique ways, even if they have similar levels of interest and influence. Some individuals might have endless patience, while others might be quick to anger. This is important to consider as you plan communications with your stakeholder management plan. Now that you’ve really wrapped your head around each of your important stakeholders, it’s time to create an overall plan for managing them as your project progresses. Because without an agreeable relationship with your stakeholders, your project is in for some rough sailing. Communication is essential for a positive relationship with each of your stakeholders. Stakeholders need clear business communications, free of jargon, that fit their busy schedule and provide them with the information that applies to their project interest. Some stakeholders will like phone calls, others emails. Some stakeholders will demand in depth task reports, while others will want overall project status reports. If you choose to use a project management software, you’ll be able to efficiently communicate with your stakeholders, allowing you to leverage those relationships and promote progress and avoid any bureaucratic roadblocks. 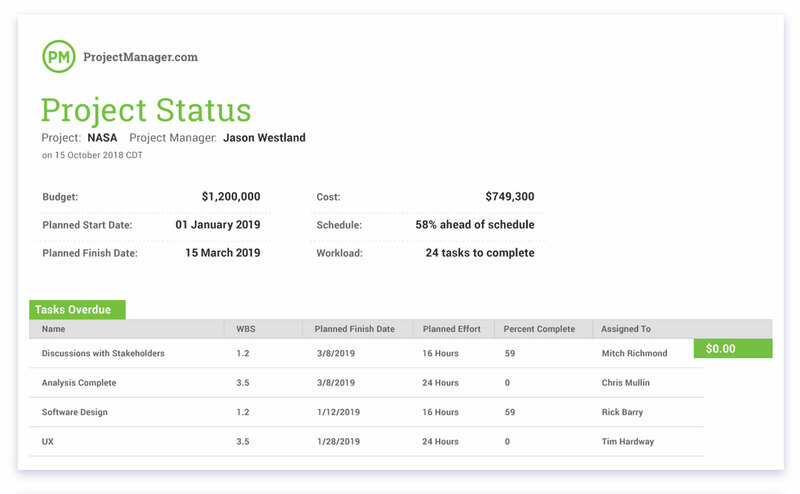 ProjectManager.com has easy reporting tools that can create status reports, task reports and project progress reports, making it easy to quickly distribute tailored reports to stakeholders, that way you’re always providing pertinent information. Of course, communication is a two way street, you need to be listening to your stakeholders throughout this process, and not just pummeling them with reports and updates. That’s where you’ll want to have a strategy to adapt to changes. It’s important to actively listen to your stakeholders when they give feedback. You should always ask questions to really understand what they are wanting from the project. It’s better to ask questions now then have to deal with another meeting later that takes up even more time. Of course, implementing changes to a project plan will require a redistribution of resources. Resource management tools can be absolutely critical in this instance. Our software has workload tools that allow you to quickly see the workload assigned to the entire team on a single calendar view, and then you can easily reassign work and project resources with just a few clicks. This allows you to adapt to changes put forth by stakeholders in just a matter of minutes. Naturally, the stakeholder won’t always be right, but do pick your battles carefully. It’s okay to say no to a stakeholder, but you better be ready to defend your argument with solid data. Use your regular communications with your stakeholders to not only converse, but to monitor their emotions and reactions. If you start to notice any abrupt changes in attitude, something might be amiss in your relationship. Stakeholder relationships can also take a hit if there are errors in the overall project execution, such as missed deadlines, inaccurate budgets or employee turnover. In such instances, it’s smart to make an extra effort to reach out and keep everyone informed. In addition to managing the stakeholders themselves, it’s also import to monitor any project changes they might have suggested. The best way to do this is with a project dashboard that gives you a bird’s eye view of all the important data. Keeping your finger on the pulse of your stakeholders is critical to ensuring a positive relationship with them. Because your stakeholders might be in other projects, you don’t want them to lose interest in your own, or to pull resources and assign them to other projects. Given everything that’s been mentioned, the importance of project stakeholder management is clear. Without their cooperation, it’s impossible to bring a project to a successful conclusion. That’s why, as a project manager, it’s critical that you create positive stakeholder relationships that will leave them happy with you, your project management, and your outcomes.